Valentines Day. We have the ones who just ignore it. I don’t mind these guys, they tend to keep themselves to themselves. Then we also have the folks who go nuts over it (namely Americans, or at least, the Americans portrayed in TV and film). And then there are the people who hate it and want everyone to know precisely why they hate it (yes, yes, Its crass commercialism at its worst, change the record please). Now I’m in a new category of didn’t see the point in it and generally ignored it, to now absolutely LOVES Valentines Day. I was the biggest cynic and believe me, no one was more surprised by my Valentine U-turn than me. Ok, maybe also my wee Austrian buddy who has now taken over my #1 cynic title. Valentines Day is like Christmas in that you have an official and approved excuse for indulgence without the exhausting days spent with relatives. And you can do what you want, there’s not set formula (again, like another holiday we know *eye roll*). You can spend it naked, you can have a Netflix marathon (with or without the chill), you can eat an entire box of chocolates to yourself, and the M&S meal deal takes the hassle out of cooking for you. Literally, whats not to love? So if a day of indulgence (be it with your mates, your luvva, or your self), in the middle of the bleak and cold winter is wrapped up in a bit of commercialism, I’m ok with that. Provided I get some form of chocolate. Enter, white chocolate dipped Madeleines. 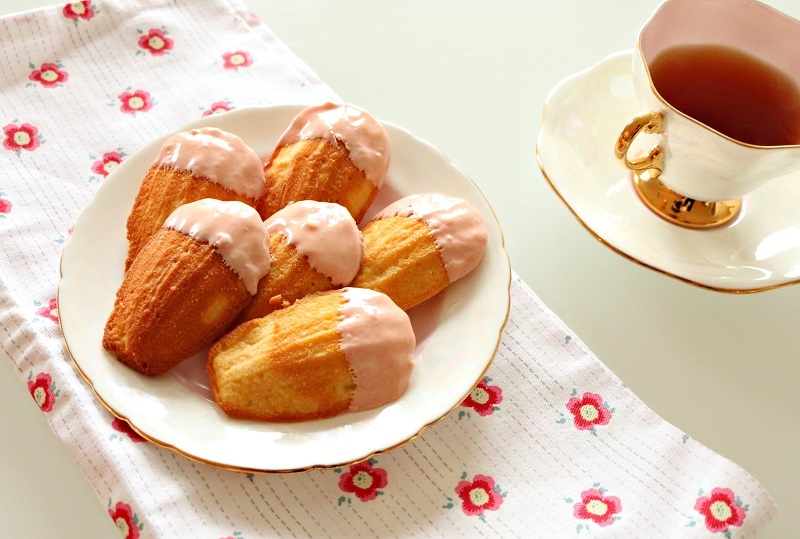 Madeleines are wee French sponge cakes. On account of their size they could masquerade as a biscuit but they are firmly a cake: think Jaffa Cake sponge. 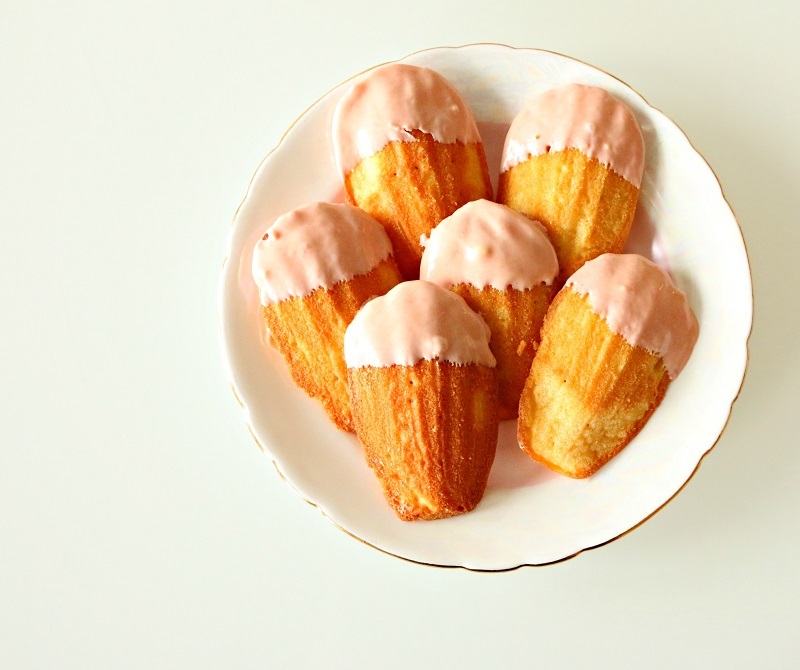 Now you do need a Madeleine tin to cook them in, and I’m sorry to say that a Madeleine tin is used for no other purpose than for making Madeleines. So if you really don’t want to fork out the cash on a tin you may or may not use again, just buy a packet of Madeleines & dip in them white chocolate. Job done. So what makes them suitable for Valentines Day? Well asides from the fact I dyed the white chocolate pink they are light: Ergo you can eat several and not feel like a beached whale while trying to seduce your luvvah on Feb 14th. Pre-heat the oven to 180C. Melt some butter and use to grease the Madeleine tin. 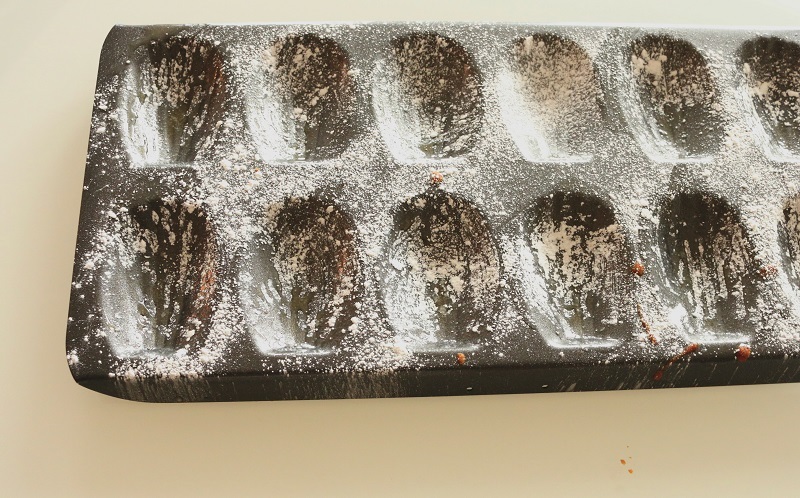 Using a sieve, dust the tin with icing sugar. 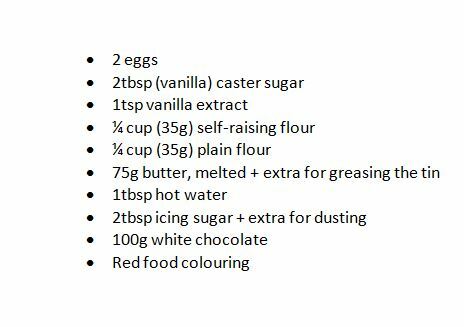 Beat the eggs, caster sugar, icing sugar, and vanilla extract in a bowl until thick, then sift the flours into the egg mixture. Melt the butter & mix with hot water (from the tap is fine), and pour this into the cake batter. Using a whisk, beat the mixture until combined. 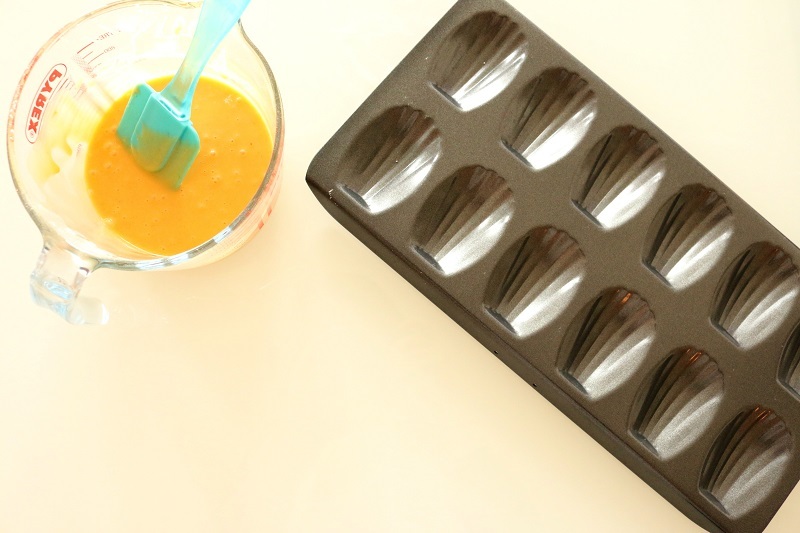 Drop 1 tablespoon of mixture into each hole in the Madeleine tin. Bake in the oven for 10 minutes. Once baked, remove the tin from the oven and tap the pan firmly onto the worktop to release the Madeleine. Gently ease them with a butter-knife if they need a little further persuasion. 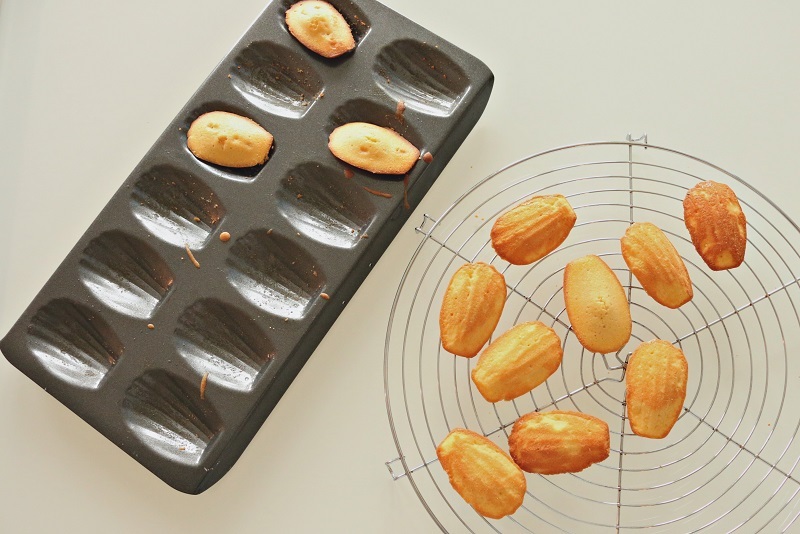 Leave the Madeleines to cool on a wire rack. Meanwhile, break the white chocolate into a bowl larger than your smallest saucepan. Fill the saucepan halfway with hot water from the kettle and put it on a gentle simmering heat. Place the bowl of chocolate over the top and leave it to slowly melt, stirring occasionally. Once the chocolate has melted, remove the bowl from heat and add a little red food colouring until the chocolate is as pink as you like. 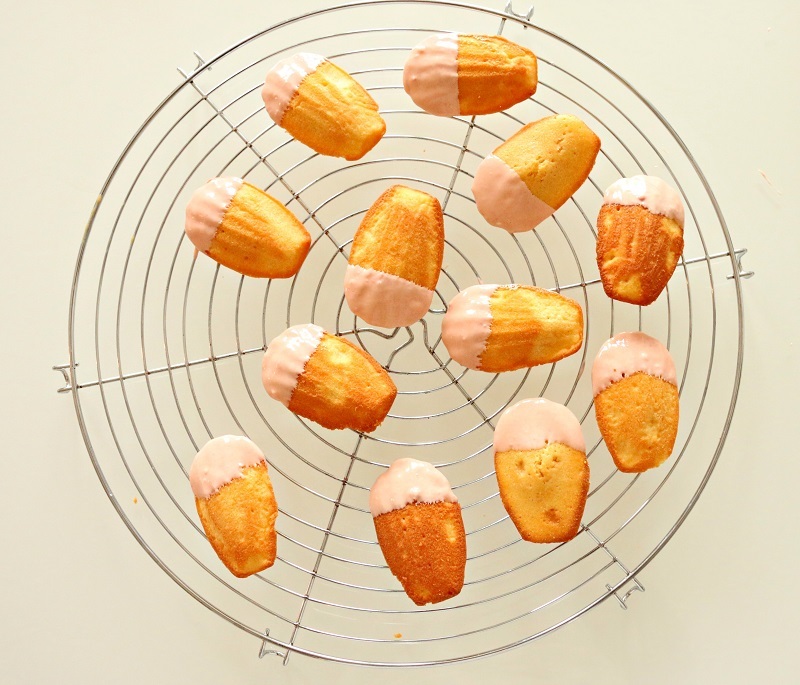 Dip the tip of the madeleines into the melted pink chocolate and leave to set on a wire rack. 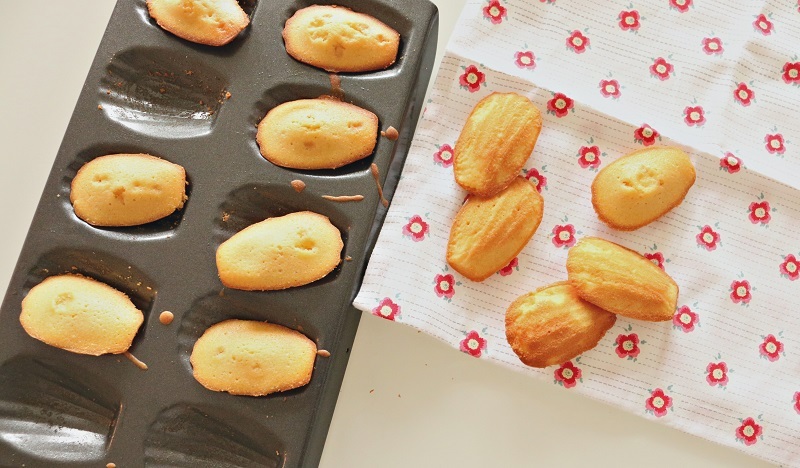 Dip the madeleines in melted white chocolate & leave to cool. Serve with an innocent cuppa..